Ukrainlastele, kes 26. juulil Koidu talu põllul töötasid, peaks ilma vahendajata maksma 1320 eurot brutopalka. Poola vahendusfirmat kasutades kaob see nõue aga ära. Of foreign workers registered in Poland, about 80 percent are Ukrainians. But Poland has unemployment too and no work for all who come. Therefore, several Polish companies have focused on mediating workers to elsewhere in Europe. Last week, a tractor was hauling a covered platform for picking cucumbers on field of Koidu Farm, Abja Parish. For such simple work, none would probably pay €1,320 a month, but this would have to be the pay for the Ukrainians on it if they’d work here under Aliens Act. Speaking for Töötukassa i.e. Estonian Unemployment Insurance Fund, specialist Karin Hage said citizens of EU, European Economic Area or Swiss Confederation are entitled to work in Estonia on basis of short term registration or temporary residence permit issued for work. To those, average Estonian pay times 1.24 must be paid in order to protect Estonian labour market from influx of cheap workforce – thence the legally required gross salary of €1,320.6 a month. However, the condition is easily avoided and unskilled workers from third countries do reach Estonia. Namely, it is much easier to bring workforce into Poland from outside the EU. For short term work, a company needs to present a document confirming that they are hiring a worker. According to Polish foreign ministry website, the worker would indeed need a Schengen visa to work in the zone, but not for the first three months. Right next to Poland there lies Ukraine with its 42 million population where UN data says up to 24 percent live below poverty level while Ukrainian statistics say average gross salary is €183. Meanwhile, a litre of fuel costs 70–80 euro cents in Ukraine. No wonder, then, that at least 80 percent of foreign workers registered in Poland are Ukrainians as covered by docent at Polish Academy of Sciences in New Eastern Europe last year. 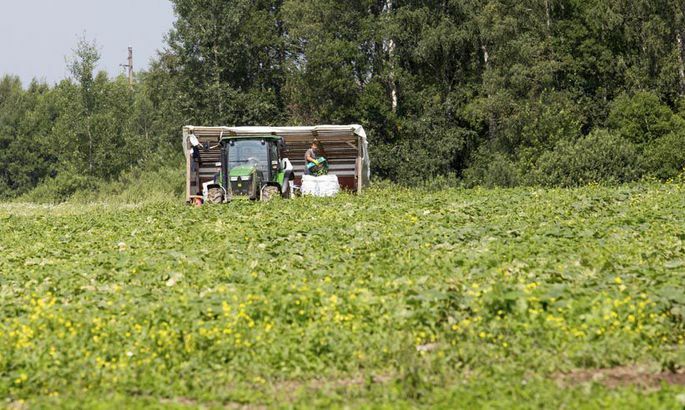 The Ukrainians working at the Koidu Farm in Viljandi County said in July that they came here because there is no work in Ukraine. They claim to hail from Central Ukraine where there is no war but the economy is very bad all over the land. It’s difficult to find a job and the wages are low. The Ukrainian hryvnia has sunk fast since 2014 regarding both the dollar and the Euro and, according to one of the workers, it’s a great bonus for them to even be paid in Euros. If Ukrainians obtain a document confirmed by employer about being hired, they may legally work in Poland up to three months. Ms Fomina writes that no such requirement applied to teachers of foreign languages, graduates of or students in Polish universities, or people with Polish ancestors who can apply for a «Polish card». But though the Polish economy is in strong growth, unemployment is over 10 percent and there is no work for all who come from abroad. Therefore, several Polish companies have focused on mediating workers to elsewhere in Europe. Police and Border Guard Board migration specialists say the scheme is simple: legally, the Ukrainians are not employed by any Estonian enterprise but in a company in Poland providing the service in Estonia. Thus, the Ukrainians are not directly under Aliens Act section 178 requiring the 1.24-fold Estonian average pay. An Estonian firm pays mediation fee to Poland and legally all is okay. The farm was unwilling to tell us via which mediation company the four Ukrainians reached Estonia. An Internet search fails to lead to the company named by the Ukrainians. At three Polish mediation forms Work Service, OTTO Work Force and Poland Workforce, they said they knew of no such competitor. The Ukrainians refused to disclose their pay in Estonia. A few weeks ago, they said in Poland they were making €2 an hour while not specifying if it was gross or net. The Estonian minimal hourly pay is €2.54 this year. Back then, the Ukrainians said they were not working in Estonia as yet while waiting for documents from Poland and spending time fishing and playing football. Having checked contracts at the Koidu Farm at the beginning of last week, Police and Border Guard Board said all was correct. Likewise, Tax and Customs Board said foreigners may not come under tax liability in Estonia with short time employment; likewise, Estonian companies may send their employees to other countries short-term and these will not have to pay taxes there. The taxation is according to agreements between states.